The Developer Services portal acts as a client of Apigee Edge. That means the portal does not function as a stand-alone system. Instead, much of the information used by the portal is actually stored on Edge. When necessary, the portal makes a request to retrieve information from Edge or to send information to Edge. The portal is always associated with a single Edge organization. When you configure the portal, you can specify the basic authentication credentials (username and password) for an account in the organization that the portal uses to communicate with Edge. If you choose to enable SAML for Edge authentication, you can then configure the portal to use SAML authentication when making requests to Edge. Configuring the portal to use SAML automatically creates a new machine user account in the Edge organization that the portal then uses to make requests to Edge. For more on machine users, see Using SAML with automated tasks. Configure SAML on Edge as described in Installation and configuration of SAML for Edge. Note: Basic Auth must still be enabled on Edge to install the portal. Do not disable Basic Auth on Edge until after you have configured the portal to use SAML. Install the portal and ensure that your installation is working properly. See Installing the Edge for Private Cloud Developer Services portal. Configure SAML on the portal. You can now disable Basic Auth on Edge. When SAML is enabled, Edge supports automated OAuth2 token generation through the use of machine users. A machine user can obtain OAuth2 tokens without having to specify a passcode. That means you can completely automate the process of obtaining and refreshing OAuth2 tokens. The SAML configuration process for the portal automatically creates a machine user in the organization associated with the portal. The portal then uses this machine user account to connect to Edge. For more on machine users, see Using SAML with automated tasks. When you configure the portal to use SAML, you enable the portal to use SAML to authenticate with Edge so that the portal can make requests to Edge. However, the portal also supports a type of user called developers. Developers make up the community of users that build apps by using your APIs. App developers use the portal to learn about your APIs, to register apps that use your APIs, to interact with the developer community, and to view statistical information about their app usage on a dashboard. When a developer logs in to the portal, it is the portal that is responsible for authenticating the developer and for enforcing role-based permissions. The portal continues to use basic authentication with developers even after you enable SAML between the portal and Edge. For more, see Communicating between the portal and Edge. It is possible to also configure the portal to use SAML to authenticate developers. For an example on enableng SAML using third-party Drupal modules, see https://community.apigee.com/articles/29201/sso-integration-via-saml-with-developer-portal.html. # IP address of Edge Management Server and apigee-sso node. # URL of Edge management API. # Org associated with the portal. # Externally accessible IP or DNS of apigee-sso. # Default is http. Set to https if you enabled TLS on apigee-sso. # SSO admin credentials as set when you installed apigee-sso. # Default is "n" to disable SAML support. # The name of the OAuth client used to connect to apigee-sso. # The default client name is portalcli. # Oauth client password using uppercase, lowercase, number, and special chars. # the Edge org specified above by EDGE_ORG. # This account is used by the portal to make requests to Edge. # Add this email as an org admin before configuring the portal to use SAML. # If set, the existing portal OAuth client is deleted and new one is created. # The default value is "n". # any of the PORTALCLI_* properties. In the Edge UI, add the machine user specified by DEVPORTAL_ADMIN_EMAIL to the organization associated with the portal as an Organization Administrator. Note: The machine user does not exist yet but is created automatically in the next step. where samlConfigFile is the SAML config file. Log in to the portal as a portal admin. 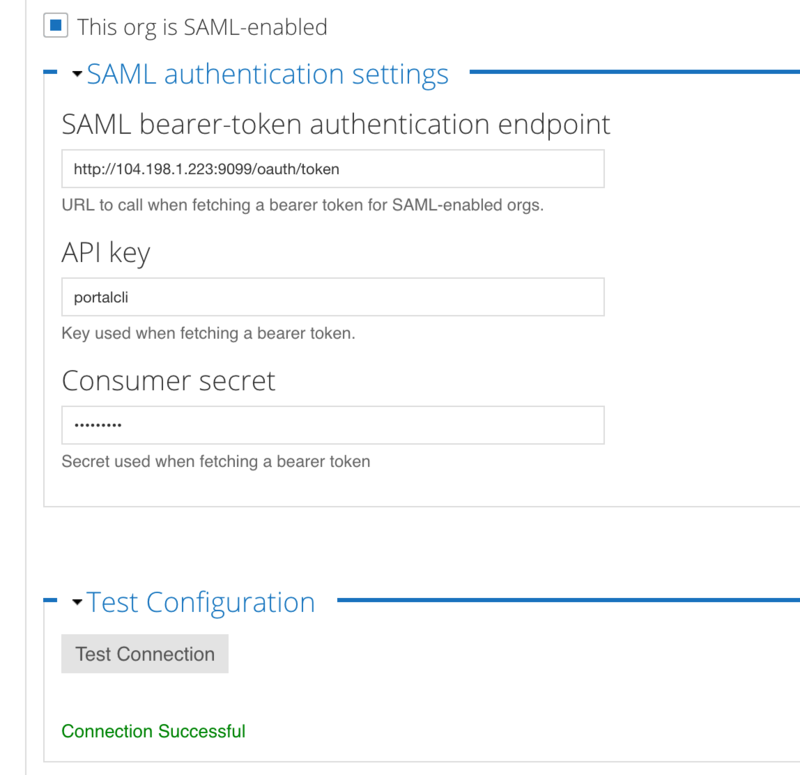 Note that the box for This org is SAML-enabled is checked, the endpoint for the Edge SSO module is filled in, the API key and Consumer secret fields for the portal Oauth client are filled in, and the message Connection Successful appears under the Test Connection button. You can press the Test Connection button to retest the connection at anytime. To later change these values, update the config file and run the command again. If you choose to disable SAML for communications between the portal and Edge, the portal will no longer be able to make requests to Edge. Developers are able to log in to the portal but will not be able to view product or create apps. Caution: If you disable SAML, you should then reconfigure it the portal to either use SAML or, if Edge is still configured to supports Basic Auth, configure the portal to communicate with Edge using Basic Auth. For more on using Basic Auth see Communicating between the portal and Edge.